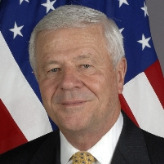 A native of Goldsboro, North Carolina, James B. Culbertson has served as the US Ambassador to the Netherlands since July 10, 2008. Culbertson graduated from The Citadel in 1960 with a BA in political science and served as an officer in the US Army Military Intelligence from 1960 to 1962. Subsequently, Culbertson worked as a salesman in a software company before founding Financial Computing, Inc. in Winston-Salem in 1974. The company provides financial applications software and hardware to automobile dealers and banks. He also served on the North Carolina Banking Commission (1973-1979), the North Carolina Board of Economic Development (1985-1993), the National Federation of Independent Businessmen (1988-1993), the Fund for American Studies Board of Trustees (1988-present) and the American Battle Monuments Commission (2005-present). He sold Financial Computing in 2000. Culbertson first visited the Netherlands in 1970 as a representative of the American Council of Young Political Leaders. He served on the council’s board from 1973-1979. Culbertson is well connected in the Republican Party. He began as a volunteer for Barry Goldwater in 1964 and was active in the Young Republicans. In 1972 he managed the Congressional campaign of Vinegar Bend Mizell and worked with the North Carolina gubernatorial campaign of Jim Holshouser. Culbertson. After 25 years as an entrpeneur, Culbertson renewed his involvement in Republican Party politics and causght the attention of the George W. Bush’s team when he raised more than &100,000 for Bush at a single event in Winston-Salem in March 1999. Culbertson was a North Carolina co-chairman for the Bush campaign in 2000, chairman in 2004 and one of eight co-chairs for the Bush inauguration in 2005. He was also finance chairman of Elizabeth Dole’s successful Senatorial campaign in North Carolina in 2003. Culbertson qualified as a Bush Ranger by raising more than $200,000 for the Bush-Cheney campaign in 2004, and he served as North Carolina campaign chairman for Rudy Giuliani’s presidential bid in 2008.